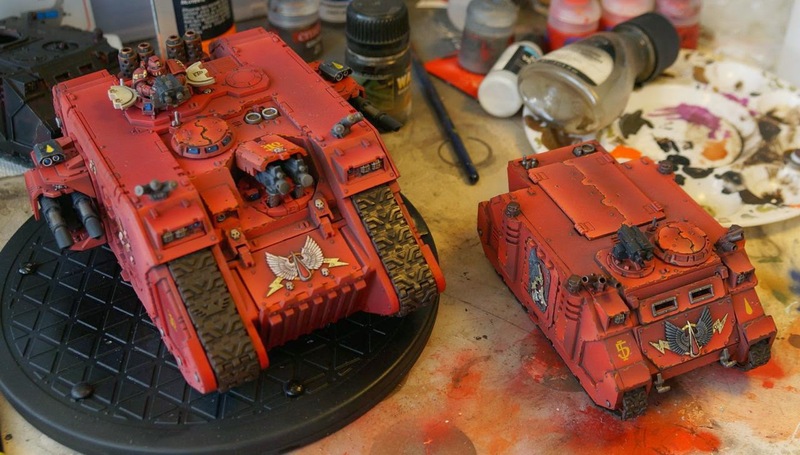 It seems repainting or touching up an army is a relatively rare occurrence for most people. I know I've stripped models to add to new armies, but even for me this feels weird. I am immensely enjoying the process, however, since there are no expectations. I am not even bothering to carefully remove mold lines. Normally I would spend a lot of time prepping my models. That is the right way. But since these guys are already painted, and are getting new highlighting sprayed over their existing base coats, the focus is on getting them consistently paint chipped and streaked so I can move on to the mud/dust phase. 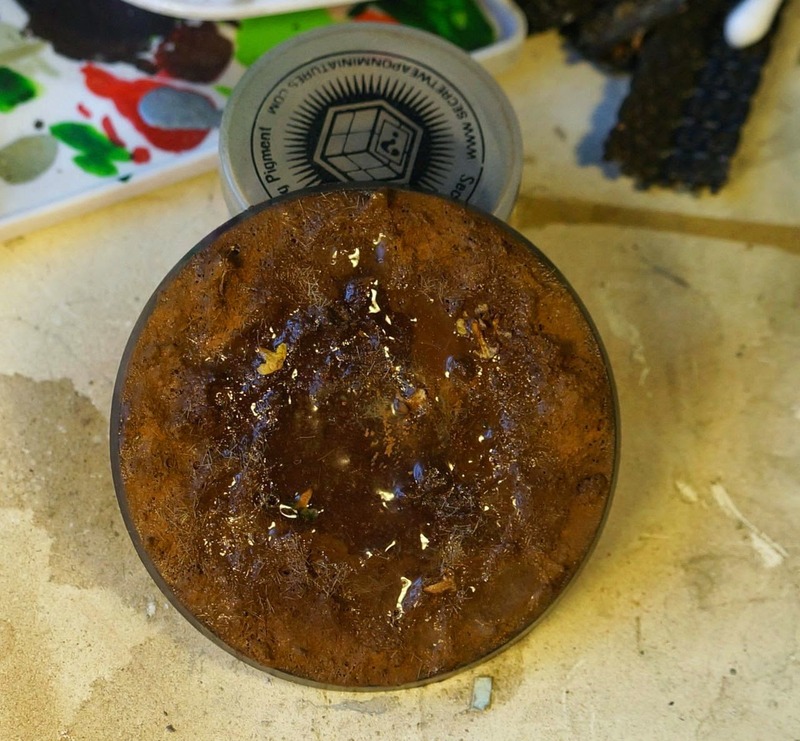 I really like how that mud base turned out, and there is a good chance I will go with chocolate brown wet mud, with dried mud higher up on the vehicle chassis. I have to decide if I save that base type for my DKoK and leave the BA on desert bases. Desert bases would at least match my gaming table. Yes... I hate the top hatch on the rhino. Maybe it is time to add stowage and gear up there. That would limit the glowing edges. another thing of note, I have a batch of vallejo matte varnish that is blueing my models when it drys. Maybe vallejo always does this and I've just not noticed due to the colors I usually use. Greg asked for some before photos to go with these WIP repaint shots. It is kind of cool to point out, that I am not paint stripping these models. 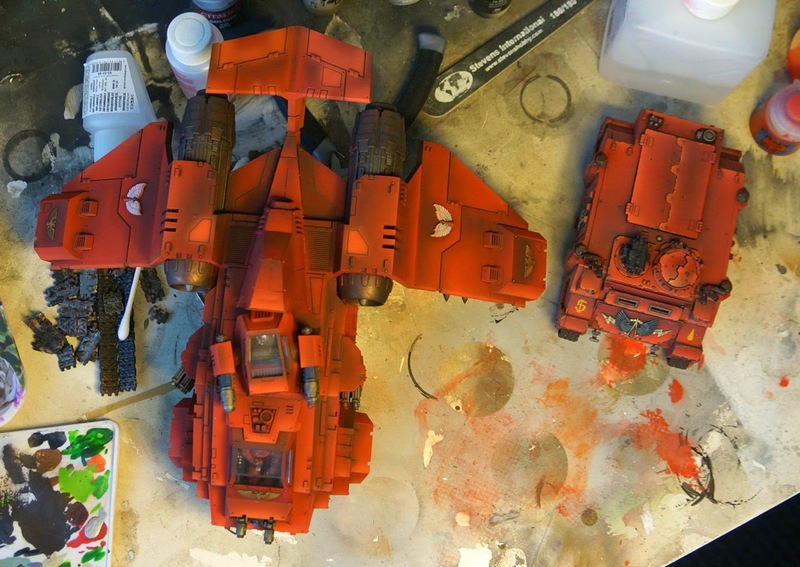 I am airbrushing directly over the original paint job. I thank Dave Taylor for the idea. We just did not have have enough time to paint strip the model, in time for the charity army raffle for the NOCF. Prior to his model, I can't remember ever repainting a model intended for use. 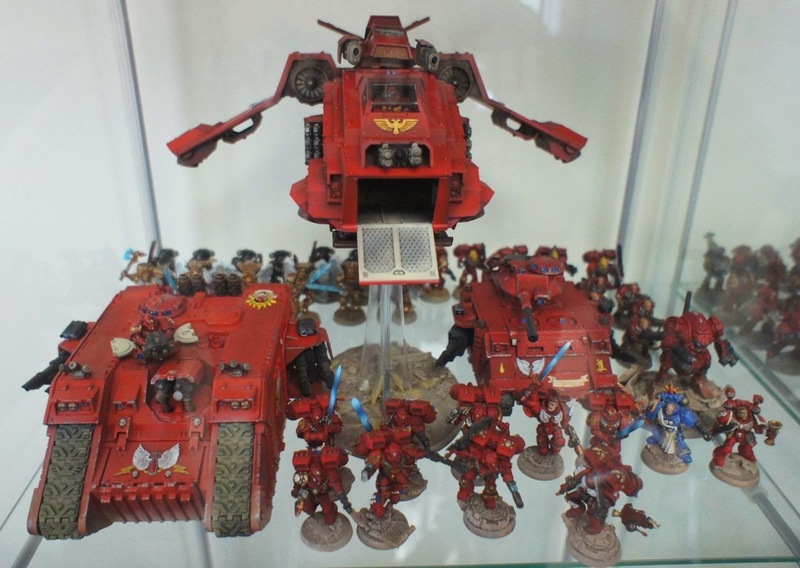 I've added a photo of my old Blood Angels force, painting in 2011. I've come a long way painting-wise. (tracks, chipping, streaking, and mud/weathering have not been completed) I am only mid-way through repainting the LR above. So far the Storm Raven has shown the most dramatic change. 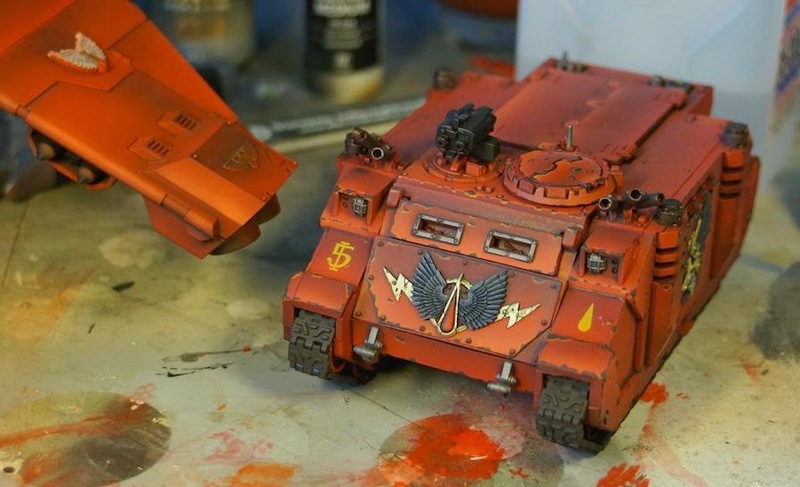 Do You Re-Paint Old Armies? I've embarked on a weird little project. Normally I will paint a few salvage pieces in order to see if I like a particular color scheme. I can't remember if I have ever updated and entire army. I just don't rebase, repaint, or upgrade armies. I pack them in a box and I move on. 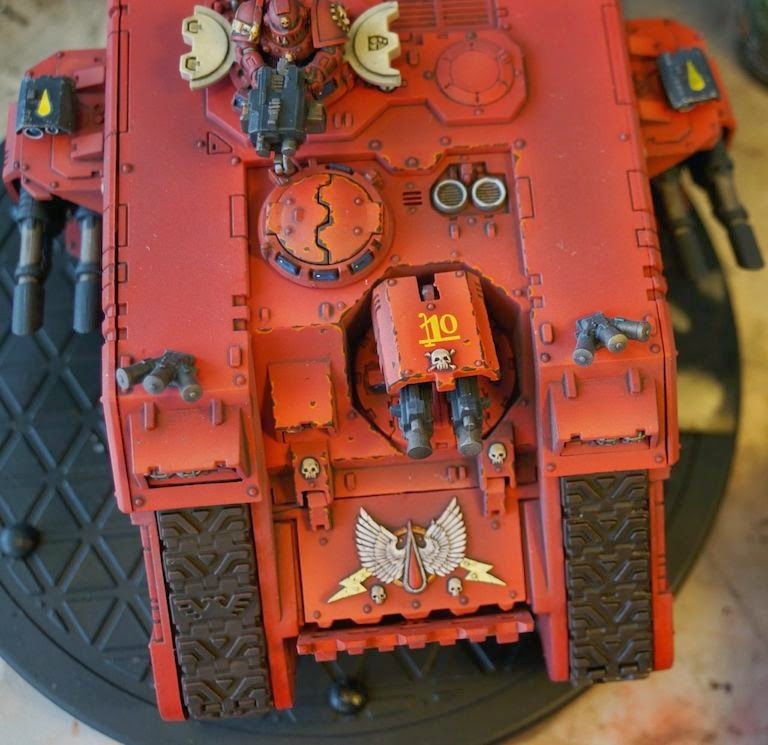 I think I am going to bulk update my old blood angels force. For some reason I have the desire to start playing the game more regularly. I thin my BA fit the bill. So with that said, there are some challenges. The first is that I am being a little sloppy model preparation. There is none! The models come complete off my shelf. My construction skills have improved a lot since the time these models were glued together, so there are a lot of sloppy areas. On the other hand, by re-painting directly on top of an existing paint job, I can skip a lot of the detail work and just focus on the eye catching bits. Plus, it means I have a lot of tanks to weather and paint chip. I think that is a win. On the basing side of things, I was thinking about doing muddy trampled earth with dead leaves and grass. This is my first attempt at mud after watching the how-to video over on Secret Weapon Miniatures. I like how it turned out. It feels a bit strange updating models this way, but on the other hand, they are ready to play almost instantaneously. Sometimes cleansing the palette is important. After NOVA I found myself besieged by projects. limited time due to a crazy work schedule, has left me with little time to properly plan for a next army project. I haven't even really felt like tackling a large project, consumed as I am with product launch for work. On the other hand, I paint to relieve stress. Rather than overwhelm myself with a lot of choices, I decided to finally try out the new(non Baal, so new to me!) 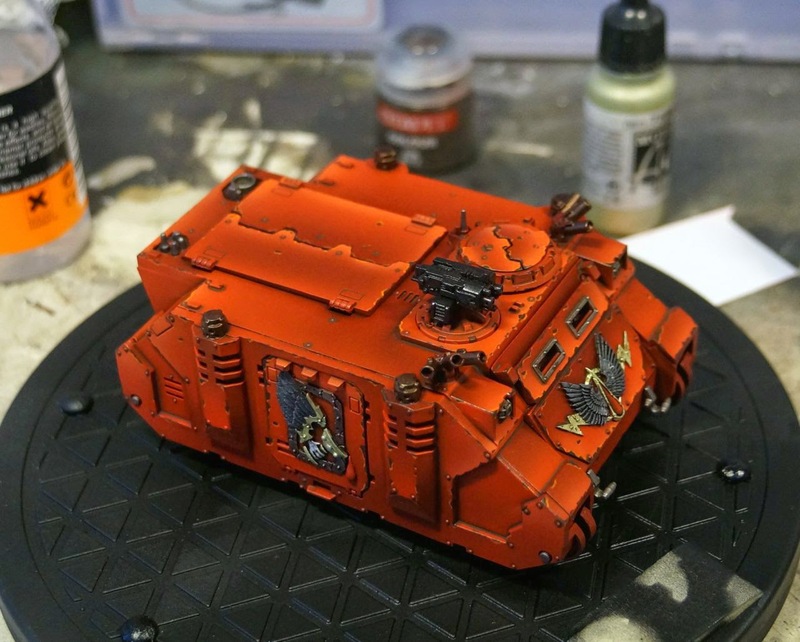 GW reds on on a salvage rhino paint stripped years ago and forgotten in a drawer. The rhino has a semi-gloss varnish on it right now, which makes it a little worse looking than normal. The varnish allowed me to add oils without ruining the base coats. With paint chips in place, I can now add decals followed by environmental effects. I might even find the tracks that were pulled off years ago. Maybe it is time for a fresh BA army. The NOVA Open was incredible. I entered the Narrative event with my Sons of Horus army, and despite a grueling early morning/late evening game managed to help humanity loose the earth. We lost, and had a blast doing it. It is hard to describe how good the Narrative really is. It plays the way I want games to play. It is a sort of a "bring what you've always wanted to see on the tabletop" and let's make a scenario where it is fun. The event is about camaraderie, and using story elements to ensure that everyone has a good time. The organizers, Owen and Steve, did an outstanding job. 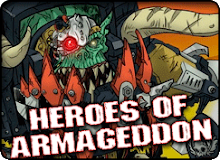 Will Nick and Kramer lead the forces of humanity to victory in space next year? How many desperate boarding actions will there be? The sky is the limit for the Narrative event. As players we dove right into the role playing aspect, and I think it showed. Hopefully next year we'll see team missions, side boards, and asymmetric battlefields and missions. Sometimes winning means loosing ground more slowly than the other side expects. No-win scenarios can be fun. Maybe we'll even see fewer games and more strategy. The NOVA Charitable foundation managed to earn 20k for Doctors Without Borders. 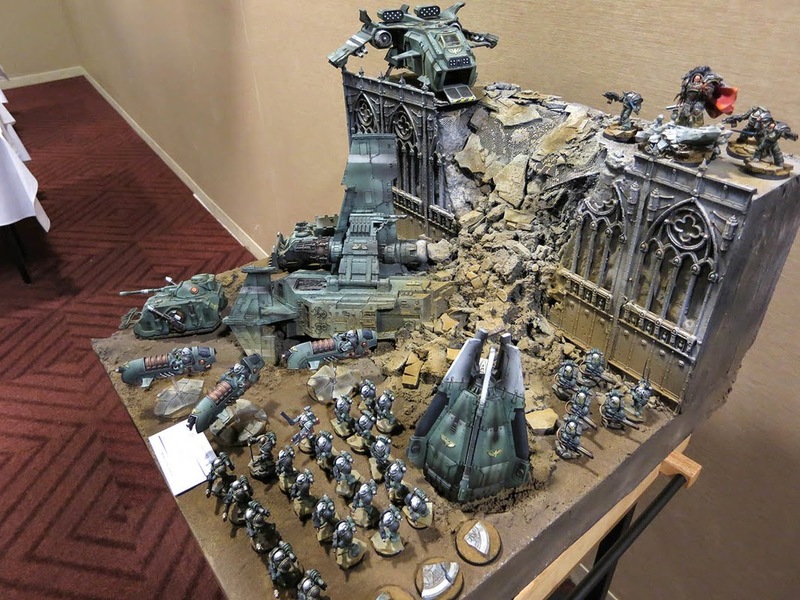 The winner of the Ultramarines force was even a member of my favorite warhammer 30K forum. I was supposed to play a game with Terranraida, but the narrative schedule left me panting for breath between games. Hopefully we'll see a Kreig supported Imperial Fists force from him at next year's event. I met a load of people this year. Todd Sherman and Greg Hess both of whom I have either blog-stalked or chatted with online were a lot of fun to hang out with. Both are great painters. Greg took a huge amount of photos, so if you want to see the huge breadth of painting at the NOVA Open, he is your man. Todd has one of my favorite Eldar armies. His stuff looks great in photos, but when you see it in person it is an order of magnitude better. 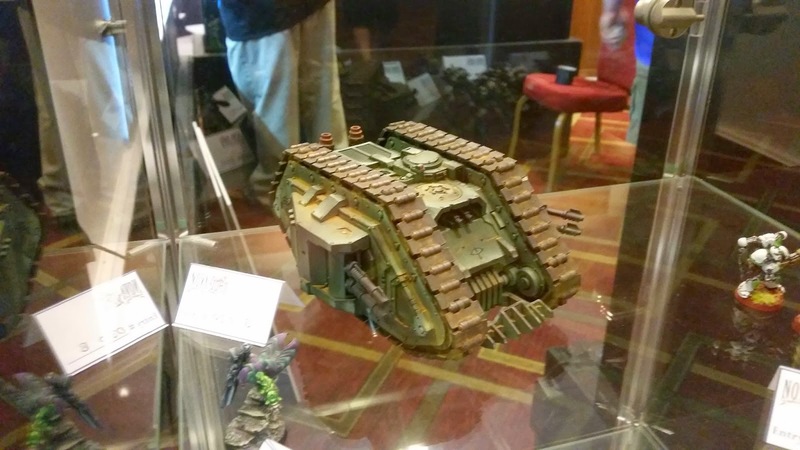 Brian Ballard and Jeff Jenkins might even convince me to go to Adepticon for some 30k action. Jeff already has EC's so maybe I'll have to paint up another legion. The Capitol Palette was a turning point for my painting. It still does not seem real to me. 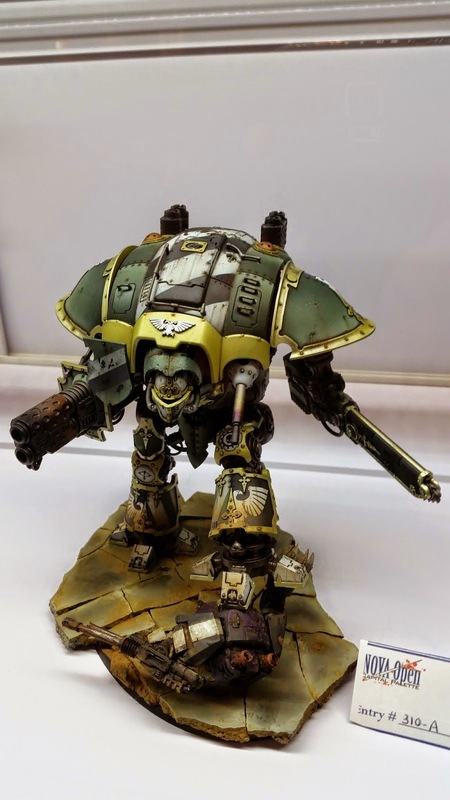 My "Imperial Knight stomping on an EC contempter dreadnought" won Best of Show. I hadn't even considered that possible. 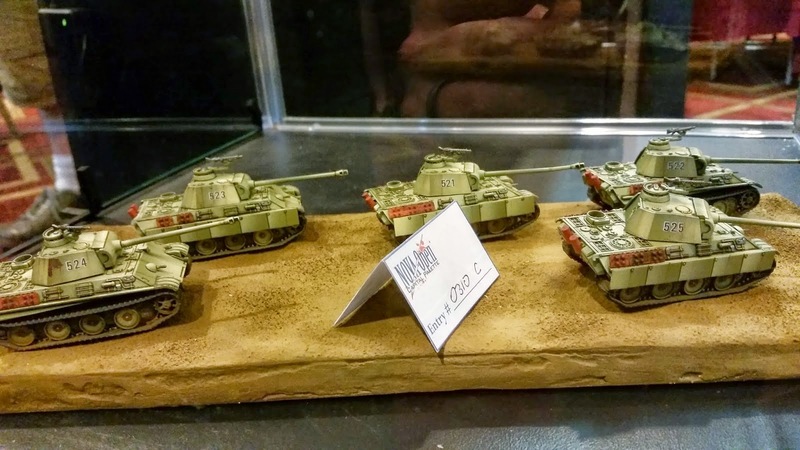 The German panthers won another gold, and the SoH land raider won a bronze. Even typing this right now it does not seem real to me. When I entered this year my primary goal was to get painting feedback. Last year a combination of seminars and paint judging by Justin McCoy spurred me to change my painting style. After last year's seminars I embraced weathering in a totally different way. I even started chasing the military modeling community in order to learn their techniques. I can't think of a better endorsement for an event. I entered a competition, took a class, and that pointed me the right direction to push my painting. I am lucky so many people kept posting encouragement on this blog and in person. That helps more than you know.